Mac OS X lets you specify Universal Access settings via the system Preferences pane, which you open by clicking the gear icon on the Dock. These settings modify the display and sound functions within Mac OS X to make them friendlier to physically challenged users. Note that if you select the VoiceOver On radio button, Mac OS X speaks the text for all text and buttons on-screen. 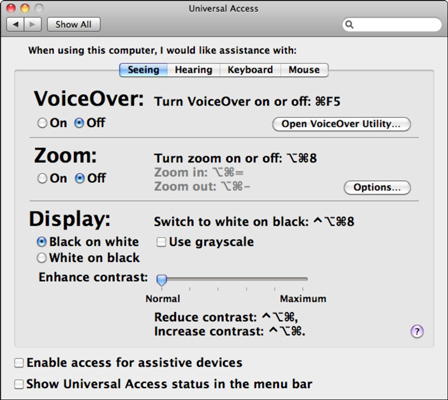 If you have an assistive device that’s recognized by Mac OS X, select the Enable Access for Assistive Devices check box to allow it to be used throughout the operating system. You can also elect to display the Universal Access status icon in the Finder menu bar. Seeing: These settings make it easier for those with limited vision to use Mac OS X. You can toggle VoiceOver on and off from here. To turn on the display Zoom feature, select the Zoom On radio button or press Command+Option+8. To specify how much magnification is used, click the Options button. From the sheet that appears, you can set the minimum and maximum Zoom magnification increments. From the keyboard, use Command+Option+= (equal sign) to zoom in and Command+Option+– (minus sign) to zoom out. Optionally, you can display a preview rectangle of the area that’s included when you zoom. Mac OS X can smooth images to make them look better when zoomed; click the Options button in the Zoom section of the pane and select the Smooth Images check box. You can also determine how the screen moves in relation to the mouse pointer from the Zoom Options sheet: By default, the zoomed screen moves with the pointer, but you can set it to move only when the pointer reaches the edge of the screen or maintain the pointer near the center of the zoomed image automatically. If your mouse has a scroll wheel or ball, you can specify a modifier key to activate the Zoom feature. If you prefer white text on a black background, select the White on Black radio button (or press the Command+Option+Control+8 keyboard shortcut). Note that depending on your display settings, it might be easier on the eyes to use grayscale display mode by selecting the Use Grayscale check box. Drag the Enhance Contrast slider to increase the contrast between text and background. Hearing: If you need additional visual cues to supplement the spoken and audio alerts in Mac OS X, click this tab and select the Flash the Screen When an Alert Sound Occurs check box. Two-channel stereo audio can be reduced to single-channel mono audio with the Play Stereo Audio as Mono check box. To raise the overall sound volume in Mac OS X, you can click the Adjust Volume button to display the Sound System Preferences settings, where you can drag the Volume slider to the right. Keyboard: These settings help those who have trouble pressing keyboard shortcuts or those who often trigger keyboard repeats (repetition of the same character) accidentally. If you mark the Sticky Keys On radio button, you can use modifier keys individually that are grouped together automatically as a single keyboard shortcut; in other words, you can press the modifier keys in a key sequence one after another instead of all together. Turn Slow Keys on to add a pause (of the length that you specify) between when a key is pressed and when it’s actually acted upon within Mac OS X. You can optionally add a key-click sound each time you press a key. To turn keyboard repeat off entirely, click the Set Key Repeat button, which opens the Keyboard preference settings. Mouse & Trackpad: With Mouse Keys active, you can use the numeric keypad to move the mouse pointer across your screen. Mouse Keys can be toggled on and off by pressing the Option key five times. Drag the Initial Delay and Maximum Speed sliders to specify how long you must hold down a keypad key before the pointer starts to move as well as how fast the pointer should move across the screen. You can also disable the trackpad on a Mac laptop when using Mouse Keys. If you prefer a larger pointer, the cursor can be resized to make it easier to spot on-screen. You can also click the Open Keyboard Preferences button to turn on Full Keyboard Access or to remap keyboard shortcuts for both the Finder and many applications.